Part one of this series shows how to install Ubuntu on the BeagleBone Black. We used a MacBook Pro to burn an Ubuntu disk image onto an SD card, and then we booted a BeagleBone Black from the image we created. This post, part two, covers the installation of the Ubuntu GUI, Ruby, and Rails. All of the commands in this article are run on the BeagleBone Black. The partition we created on the SD card (in part one) is too small to hold the Ubuntu GUI. Solution: The SD card has some extra room, and we can re-size the partition. We can install the Ubuntu GUI with a single line command. But it takes an hour for the Bone to download, compile, and install all of the GUI libraries. If we try to install the GUI with insufficient space, the installation will fail midway and we will have wasted half an hour. So it’s best to re-size first. Why didn’t the partition have the right size when we originally downloaded the image file? Good question. df is the Unix ‘disk free’ command. It shows used/available disk space. ll is one of the useful aliases built into Ubuntu’s .bashrc file. We can use it to examine the partitions on the SD card. fdisk will resize the partition we’re after. root priviledges are required to modify the partition table, so we’ll use sudo. The standard sudo disclaimer applies. p prints the partition table. n creates a new partition. w write new information to the partition table. Here’s the plan: In order to increase the size of /dev/mmcblk0p2, we will delete it, and then re-create it with a larger size. Note the use of the d and n commands in the following sequence. When fdisk asks us for the new partition number, type, first sector, and last sector, we will choose the defaults. Choosing the defaults will use all of the available space on the SD card. Your numbers will vary depending on the size and configuration of your SD card, but the general procedure will be the same. The warning/error message at the end just means that we need reboot the Bone before the partition table takes effect. Reboot the BeagleBone Black, holding down the boot switch (closest to the USB port) to ensure that we boot to the system on the SD card instead of the eMMC. After the Bone reboots, run resize2fs to expand the partition created above. The filesystem on /dev/mmcblk0p2 is now 951424 blocks long. And now we have enough room to install the Ubuntu GUI. 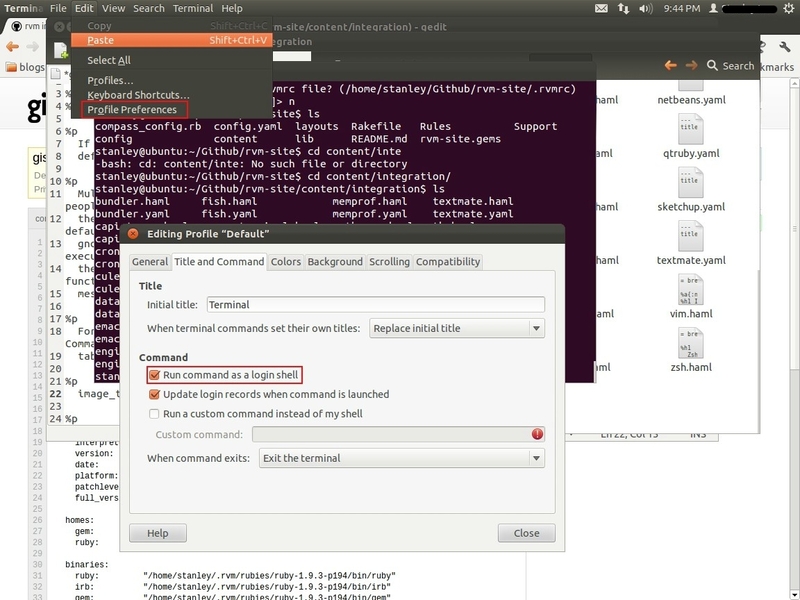 Update (Feb2014): In the comments below, Jonathan Chan describes how he updated the desktop installation files before installing the Ubuntu desktop. To update the desktop installation files, grab the latest list of packages (update) and then upgrade the packages that need it. Several minutes later, the Ubuntu 12 GUI will appear. Congratulations! Login using the default credentials (login: ubuntu, pw: ubuntu) to get to the Ubuntu desktop. For RVM to work properly, you have to set the ‘Run command as login shell’ checkbox on the Title and Command tab inside of gnome-terminal’s Settings page. This image shows the checkbox mentioned in the quote. It’s inside of the lower red rectangle. Details are in the RVM support article Integrating RVM with gnome-terminal. Ruby installation initially failed (speculation) because the Bone went into power save mode during the installation process. Ruby installed successfully on the second try when I kept the machine awake by moving the mouse. This power save hypothesis has not been thoroughly tested. Side note: If you want to see what a Node.js-equipped Bone can do, check out OpenROV. 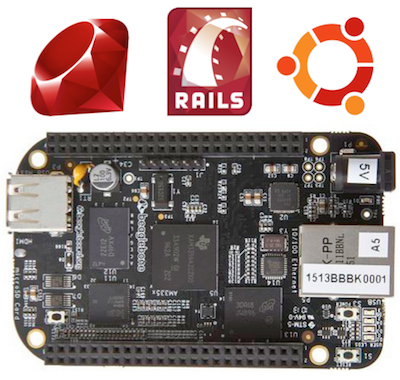 Bottom line: Ruby, Rails, and Ubuntu can run successfully on BeagleBone Black, with Node.js as a bonus. The BeagleBone Black is a cool option for running Ubuntu. Yes, it runs slower than a typical laptop. But it runs, and at $45 each we can build a cluster of Bones if we’re concerned about performance! What an amazing bundle of technology. You might also be interested in Ruby on Raspberry Pi.